Two progress status reports today! First is the Trifles sampler, in progress as a dorm gift to Younger Daughter, who will need such a thing in a year or so. (I have given myself lots of time for completion). As you can see, the motto is finished, using four different alphabets from Ramzi’s Sajou collection. I’ve played with them somewhat, working in the gold color accents, which are not marked as a secondary color on the charts. 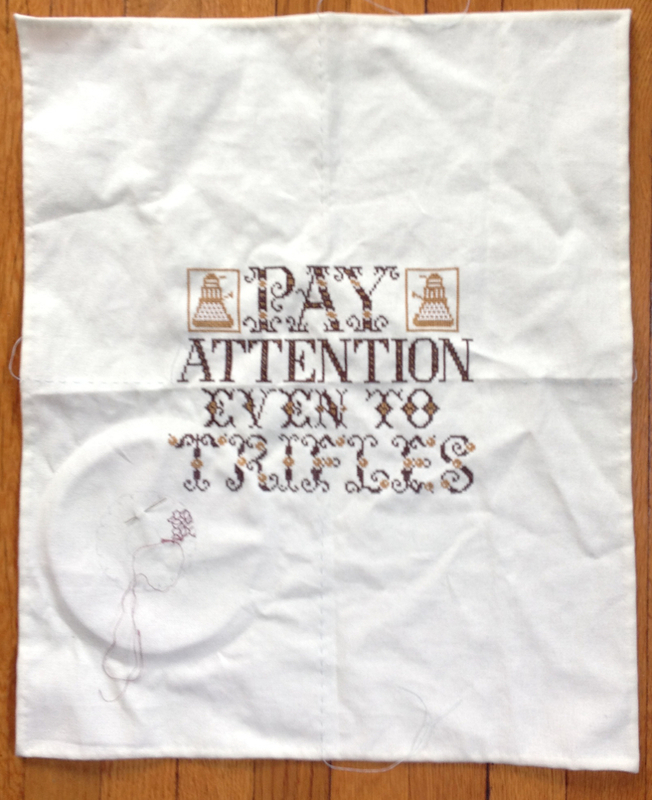 I have also stitched in two small Daleks, to comply with her request, stitched in gold and off white silks. I am up to the surround now. I had originally planned to stitch lots of linear strips, patterns from my upcoming book, but as I alluded to before – I have been seized by Another Idea. The small stitched area just getting underway next to the T of TRIFLES is the beginning. I am going to make an interlocking and overlying mesh of gears of various sizes and configurations, each outlined in a heavier non-counted stitch, but filled in using the geometrics found in my Ensamplario Atlantio. I’ll be using coordinating fall colors for these – a bit of the brown and gold from the alphabet, but also cranberry, silver, and possibly a deep green. The total effect should be rather Steampunk, and a lot of fun. However as much fun as this piece is, necessity intrudes. A friend of mine is welcoming a baby come the turn of the year. 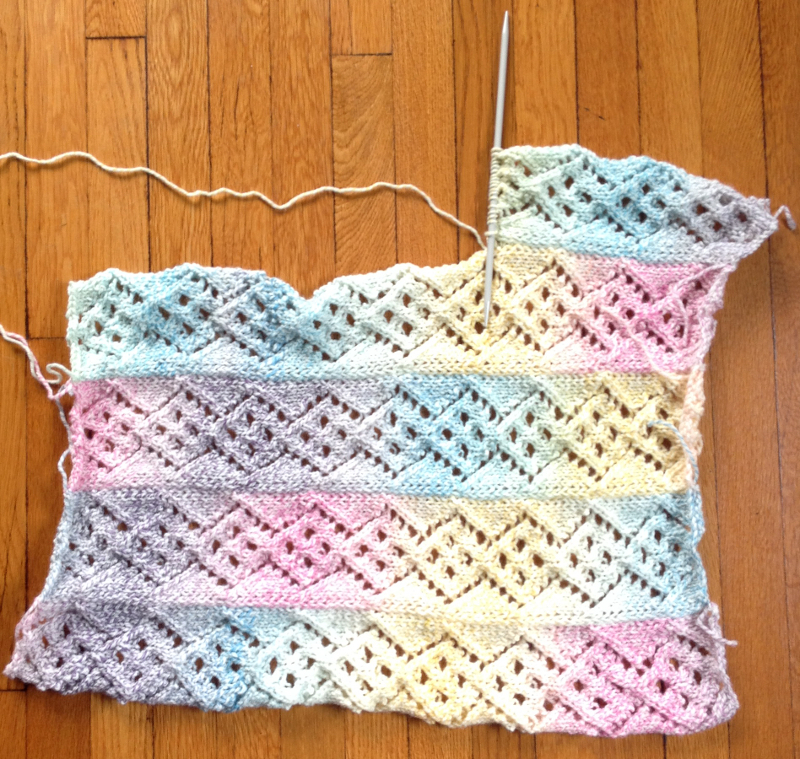 She’s expressed a fondness for traditional baby colors, so I am knitting up a small baby blanket for her. It will be car-seat and basket sized, not crib or reception size, so it is going quite quickly. I’m using Encore Colorspun worsted, an acrylic/wool mix for maximum washability, this being a baby blanket and all. I’m knitting it on US 10.5 (6.5mm), which is relatively large for worsted in order to bring out the lacy stitch pattern. The stitch pattern itself is adapted from an 18-stitch-wide strip pattern appearing in Knitted Lace Patterns of Christine Duchrow, Volume I. I’ve chosen the narrow strip so that the gradual color changes pool, rather than speckling across the rows. I’ve also chosen to work the stripes horizontally because I only have four balls of this yarn. If I had run the piece the long way I might have risked running out before I reached a useful width. By fixing my width, I can keep going until I have just enough to do an edging, or I can find a coordinating pink or off-white Encore for the edging, if there isn’t enough of the graded color yarn. And finally, being a lazy person and not wanting to sew the strips together, I am using the long-loop join method I learned while working Fania Letouchnaya’s Forest Path Stole to knit the strips together as I march along. Oh, and yes – those are massively long DPNs – about 12 inches long. I really like extra long DPNs for hats and sleeves, and generally don’t use circulars for anything less than 20 or so inches around. As a result I’ve got a collection of these admittedly unusual needles. I love the touch of gold in the lettering – love the wonderfully whacky Sajou alphabets. The sampler is coming along lovely, I like the idea of the gears for a steampunk theme.